Firstly, I want to thank everyone for all your encouraging comments and suggestions on my last post. I got some confirmation on some ideas I had already been tossing around, and some things I hadn't considered, but which would be very do-able, if not radical! I was very interested in your different opinions, which helped me realize that the final results are very much subjective. I did happen to find a 30 inch strand of green, hopefully enough to finish those 20 stitches! But that still leaves the neck band, which I really prefer would match the front bands, so I worked on two possible solutions over the weekend. I figured that I'd start with these, and then move on to another idea if neither one worked. The first, was to knit some swatches to see if I couldn't come up with a two color band, imitating the Fair Isle stitches I'd used in the sweater. My problem here, was that I couldn't figure out how to adapt Fair Isle to a k1p1 ribbing. The other thing I decided to try, was to dye some of the white yarn to see how well I could match the green. I realize that the chances of actually accomplishing this were slim to none, but I thought I'd give it a try anyway. My first major at university was painting, and one thing I had was an eye for matching color. It wasn't something I could explain how I did, but by mixing paints on my palette, I could match any color on anybodies canvas. However, I know that dyes don't work the same way paints do, but I still had to give it a try even if only to prove to myself that I couldn't do it. 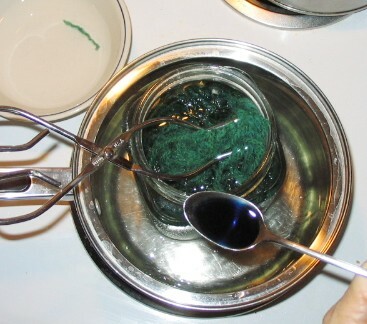 I knew that the green in the sweater was Cushings, and I seemed to recall that the old dyestocks I have on hand were mixed at the same time. I was out of the Ocean Green, but still had some Lemon and Sky Blue dyestocks leftover. So I set about, adding one spoonful of each at a time, turning up the heat, and checking my progress. I kept a small snippet of the yarn I was trying to match in a bowl of water. this way I could compare the colors while wet, as I know that colors lighten some with drying. What do you all think???? Would anyone notice if I used it for the neckband???? One difference I notice is that I did a better job on the new skein. The original skeins were a little spotty, which shows up in the knitting. Still, if was just for the neckband........ maybe it would work? By George, I think you've got it! Genius. Nicely done. I cannot see which strand is the 30" piece within your newly dyed skein. Go for it! What a great job! It will not show and if it does it will look just fine. It looks good to me on my screen the top pic looks like is matches, and the bottom pic look like a totally different color. I think you should try a swatch and see if you can live with it, beacause after all your the one who has to love it. I think all your readers already love it and whatevery your come up with LOL... I think your wonderful and you do have the EYE!! Great dyeing job Leigh. 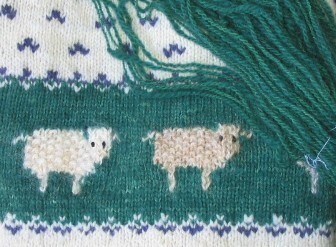 You could do a hemmed neckband to create your fair isle design rather than trying something like that in ribbing. I can't see the difference in greens on my monitor, looks like you got it. Maybe a slip-stitch row in the ribbing, where you slip the knit stitches but purl the purls? Do that on a green row with a white row next so the whites show up as purl dots, perhaps. But swatch it first -- ribbing is tricky to keep stretchy when you start doing color work. The sweater is terrific! Congrats on doing such a neat project. Thats' pretty amazing according to my monitor. go for it!! That looks perfect on my colour monitor! Way to go Leigh! That is amazing! Looks like it matches to me. T.
What if you did a corrugated ribbing, alternating the two greens?? What a wonderful job you did. I had to stare at the screen for a few long minutes before I could see the difference. To be sure YOU don't always notice the difference, perhaps the alternating that was suggested? I like sheepish Annie's point about alternating the two yarns in your knitting, and as others have said, the match goods good from out here. I've got my fingers crossed for you, but it seems to me that this could in the end be a detail that no-one else will see unless you point it out to them. A further strategy - if anyone seems to be peering closely at the collar when you're wearing it, smile and distract them!! Hi Leigh I once did a crochet jacket. I found there was a mistake on the back. I spread it out and showed it to everyone I could think of and asked them if they could see the mistake which was jumping up and down saying "look at me"! Nobody but me could see the mistake! I htink your colour match is so good that you can get away with it :). I can't tell the difference on my monitor either. I concur with the alternating - but if anyone peers closely at your sweater it probably would be in awe!